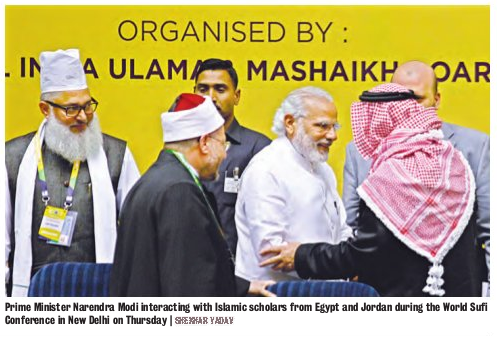 Prime Minister Narendra Modi, who yesterday delivered the inaugural lecture at the World Sufi Forum, was greeted with chants of 'Bharat Mata Ki Jai' slogans as soon as he climbed the stage by people sitting in the audience. Later, when Prime Minister Modi was about to begin his speech, the slogan was again chanted, reportedly by same men. The greeting to the Prime Minister comes in the backdrop of a bitter row over the slogan, triggered by Rashtriya Swayam Sevak (RSS) chief Mohan Bhagwat's comment that the young generation should be taught to praise Mother India.